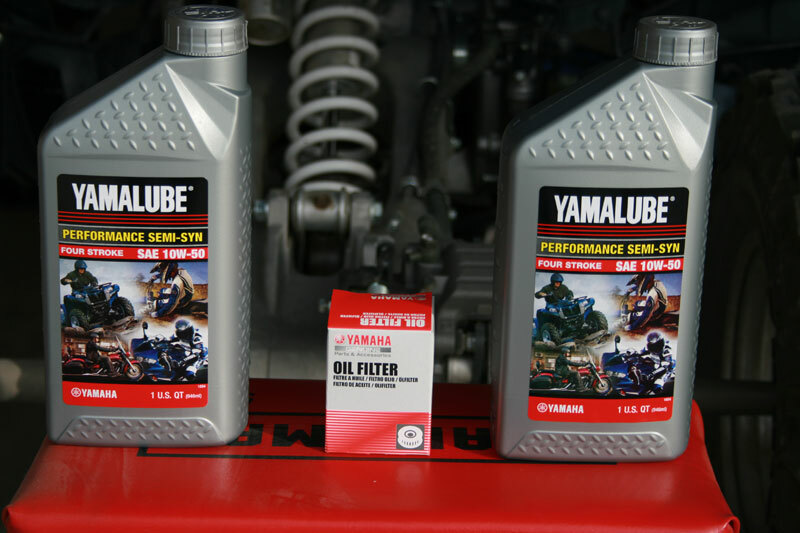 Changing your ATV’s oil doesn’t need to be done by a dealer or a repair shop. It can easily be done in 45 minutes by anyone with opposible thumbs, and it can easily be done in your garage with minimal hand tools. Step 1: Remove the oil dipstick from the top left side of the oil tank . For the impaired or special its the tank right in front of the engine mounted on the bottom bars of the frame. Step 2: Remove the crankcase oil filler cap from the right side of the engine on the clutch cover. Remove all 3 oil drain bolts. The first bolt is located on the bottom of the engine case near the center. It will be obvious as there aren’t many bolts in the middle. This bolt will allow the oil from the crank case to drain. The size of the bolt is 22mm, or in a pinch a 6 point 7/8″ socket will work. 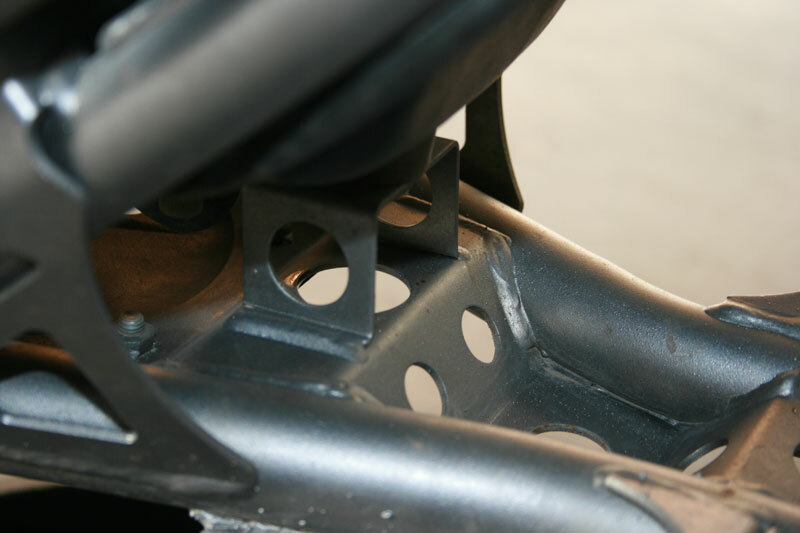 You may have to remove the engine skid plate depending on what type of plate you’re running. Some have better access than others. The second one is located at the bottom of the oil tank. This bolt will allow the oil from the oil tank to drain and should require a 12mm socket. You will need a socket extension to reach it. Again you may have a skid plate in the way, you can either drill a hole for access or remove the skid plate. 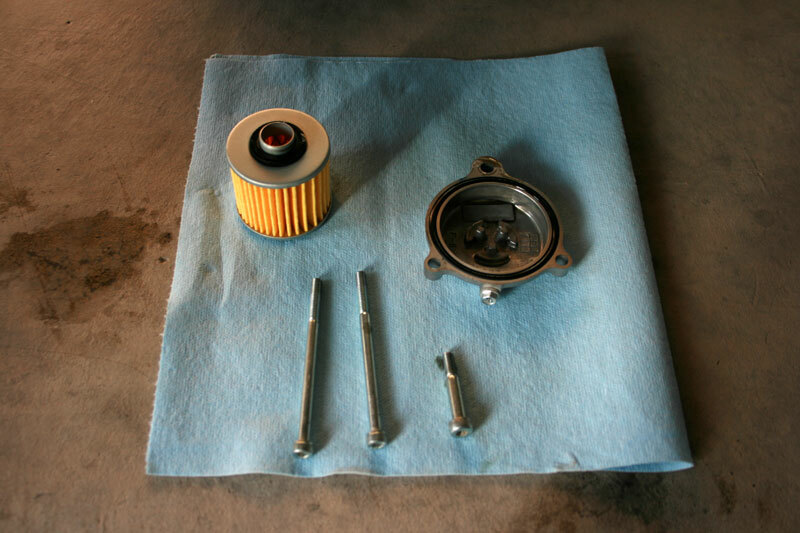 Step 3: Allow oil to drain completely out of the engine, oil filter and oil tank. 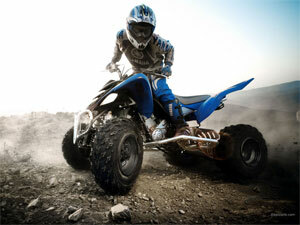 You may rock it, roll it or just allow the ATV to drain on a level surface. Step 4: After draining all the oil out, return the crankcase and oil tank drain bolts to their respective locations (hold off on the oil filter drain bolt if you are replacing the filter). I typically hand tighten them. The bolts do not need to be put in with a lot of force. WARNING: BE VERY CAREFUL with tightening these bolts, especially the crankcase drain bolt as it can strip out very easily leading to an expensive repair. The Yamaha Raptor service manual recommends 17ft lbs on the crank case bolt, 13ft lbs for the oil tank bolt. Step 5a: Some people will change out the filter every other oil change. 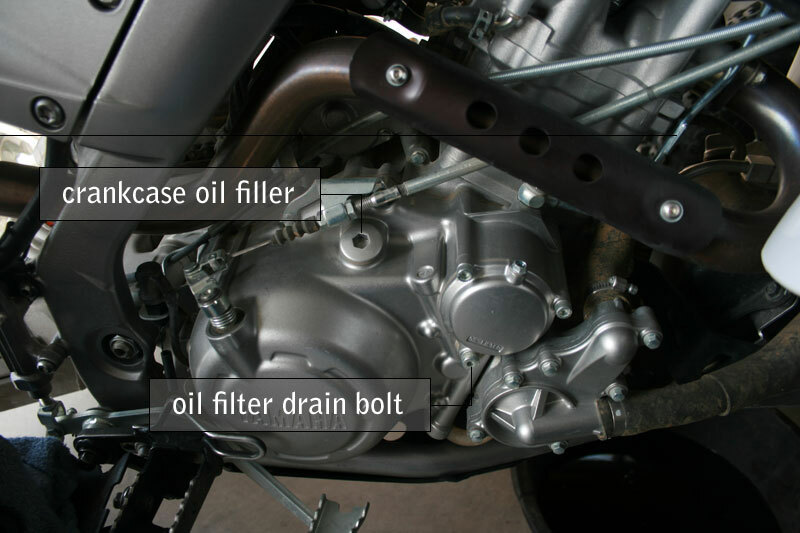 If you are not replacing the oil filter put the oil filter drain bolt back in place and skip down the list. Torque spec is 7.2ft lbs for the oil filter drain bolt. 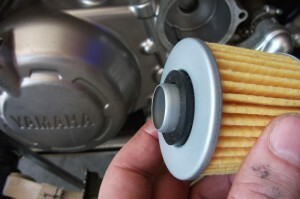 Step 5b: If you are replacing the oil filter continue with this following step. The oil filter is located on the right side of the ATV under a cover and secured by 3 bolts. You have already removed the lower bolt, the drain bolt, in a previous step. Now you need to remove the other two bolts and remove the cover. Step 5c: Check the oil filter cover o-ring on the inside of the cover. Inspect it for damage or warping. If it’s bad it needs to be replaced. I have yet to replace mine in 4 years. Step 6: Remove the old filter. Note the orientation, the open end of the filter goes to the back, the closed end to the front. It won’t fit in the space if its backwards. There are o-rings on each end, these are part of the filter and can be discarded along with it. Step 8: Replace the oil filter cover, the two upper bolts (long ones) and the shorter, lower oil drain bolt. ATV engines while they seem the same are not. They are all different. They are all close but depending on how owners care for their ATV’s and just random variables can make these numbers change. You should purchase 3 US quarts to be safe. Here are the oil capacities listed by the OEM service manual. 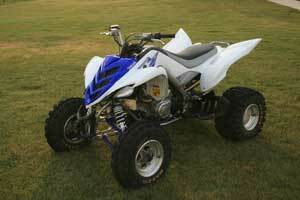 You make the choice, YAMALUBE 4 is the easiest choice but there are almost as many options as there are ATVs. ATV oil is not the same as car engine oil. It has a modifier in it for the wet clutches. The service manual says 40degrees F to 120degrees F use 20W40, 10degrees F to 100degrees F use 10W30, Under 30degrees F use 5W30. Oil weight rule is the hotter the weather the thicker the oil and the colder the weather the thinner the oil. You are free to choose other weights, but the manual’s suggestions are a good guideline and in most situations I agree with it. Step 9: Adding oil requires adding it in two different locations, the crankcase and the oil tank. If you are replacing the filter then you may be able to simply add one quart to each location and get quite close to the proper level. Otherwise follow the above specifications for oil amounts and locations. I use a small hand pump I picked up at Checker Auto parts for a few dollars. Step 10: Replace the oil tank dipstick and the crankcase filler cap (torque spec for this is 8.7ft lbs). Start the engine and either let it idle until the engine has time to warm up. Shut it off and check the oil level. Remove the dipstick, wipe it off with a rag or paper towel. Then insert the dipstick back into the oil tank, DO NOT screw in the dipstick. Check your oil level; if you need more add it to the tank, if you have too much use a plastic pump or a baster to siphon some out of the tank or simply crack open one of the oil drain bolts. Cracking the bolts is harder to control the amounts especially if it’s only a small amount. After you have the proper level wipe down any oil spills and replace the engine skid plate. I hope this helps to clarify the process and save you money by doing it yourself. Please post any questions or suggestions you have. If none of this makes sense there is always YouTube.